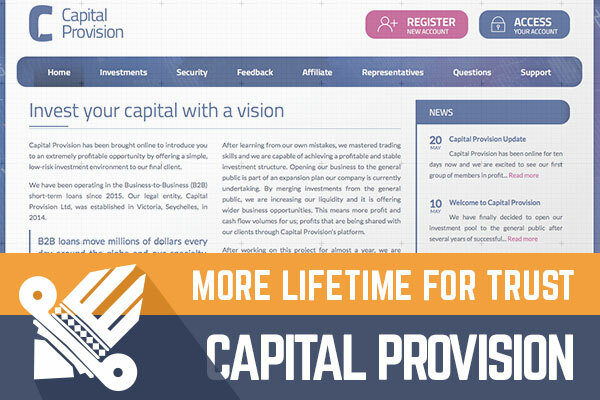 Capital Provision is Golden Stage project that joined us on 12th May with $400 reinvestment. 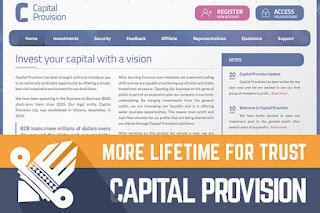 If we judge from the title than seems that Capital Provision is entirely original and unique project. The project offers middle term investment plans (with initial deposit return at the end of investment term) and at this moment only a few shortest investment plans have finished and, for now, it is just a start of this project. From the design point of view, the project is very typical HYIP and does not stand out much if we compare it with other projects. But there is one fundamental difference apart from other projects - Capital Provision use completely custom script, and at least I have not seen such script earlier before. Hard to say how much administrator has spent for development, but the sure thing is that he has spent more than other administrators on some typical HYIP project. There is quite a rich amount of information on the website, and I'm sure that if you will have some issue, there is almost no need to contact support, just check all pages or FAQ section and you will find most of the answers. The sad thing is that Capital Provision accepts only Perfect Money, Payeer, and Bitcoin because there is also other payment options that significant part of HYIP investors use. Of course, I think that the reason why most of the projects accept just these three payment options is simple - no verification and countless sites where to exchange such funds. To summarize, I must say that for now project is in very early stage and administrator promises (at least in the newsletter) that new languages and some additional bonuses will be added to this website shortly. I have this feeling that this project might be a nice competitor for other great projects, but at first it needs to grow lifetime. Lifetime will make a trust to this project and because of a lifetime, more investors will join. I wish to the administrator not to burn and not to overspend with advertising and with lifetime surely investors will come. In the end, I want to remind that if you plan to invest in Capital Provision than I recommend to spend only that you can afford to lose. Investment plans: 2% up to 3% daily for ten up to 30 calendar days, initial deposit returned at the end of the investment term.